Training plays a central role in shaping up an individual to the requirements of a job and the organisation. As can be observed from the above statement training must have twin focus viz. requirements of job and requirements of organisation. Lack of training for job performance is easily detectable whereas lack of training for orgnisational requirements hardly shows up unless one digs for it. Even then it is hard to establish. The diagram given alongside captures various issues that are associated and caused by poor or lack of training. 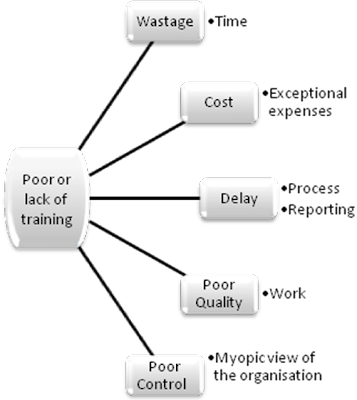 In the diagram, ‘Delay’ and ‘Poor Quality’ issues are caused by poor training for the job while ‘Wastage’, ‘Cost’ and ‘Poor Control’ issues are caused by lack of training to integrate people with the organisation. As mentioned before it is difficult to spot, track and remove wastage, cost and poor control issues arising out of ‘poor or lack of training’. Therefore it is important for every company to ensure comprehensive training for all. It should be continuous and reemphasizing. A comprehensive approach to training is given below. Structured approach has to be adapted in order to provide well rounded training to people at work. Hope you find it helpful. Give me your feedback.